The US/Mexico border between San Diego, CA and Tijuana in Mexico is the busiest land border crossing in the world. Over 30 million vehicles and 18 million pedestrians cross annually, with the border gateway at Interstate 5 suffering significant congestion. Additional delays and safety issues were caused by large numbers of nonmotorized travelers coming into conflict with cars and trucks at the crossing. 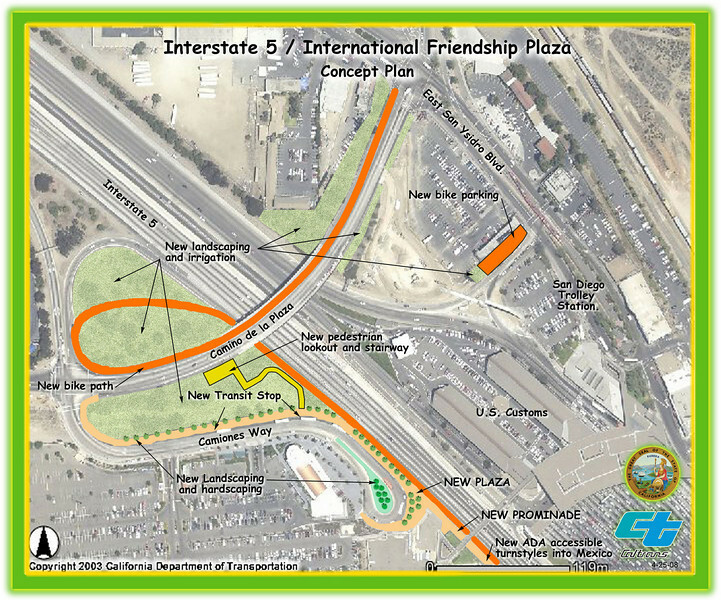 The California Department of Transportation initiated the International Friendship Plaza project to address these issues, and to transform the crossing at Interstate 5 from one more large piece of ugly infrastructure to a human-scale, comfortable, interesting, and clean border crossing experience. The project created a new plaza and promenade on the California side of the crossing, improved circulation through transit and private-vehicle drop-off areas, accessible pathways and turnstiles for disabled travelers, bicycle parking facilities, and formal pedestrian street crossing routes. Public art, historic interpretation, trash receptacles, lighting, and plantings all enhance the experience for travelers passing through the crossing. The project was funded in part through $2,246,000 in federal TE funds in 2003. In 2008, the completed project was recognized as outstanding with an Exemplary Human Environment Initiatives (EHEI) award by the Federal Highway Administration.